Have you heard of bulletproof coffee? It has been something my husband and I have wanted to try, and had resurfaced recently in a morning conversation. The concept is that creamer is replaces with a pad of butter and a bit of medium chain triglyceride (MCT) oil (or coconut oil in some copycat recipes) for a morning cup of joe that is said to give you more energy. While trying bulletproof coffee is still on my list, I did try something new this week – coffee cherry flour. It caught my attention as I was meandering through the bulk bin aisles at my local grocery store, mostly because I had never heard of it. It looked like cocoa powder, but I didn’t know if it was actually made of coffee. It turns out coffee cherry flour is a gluten free flour made from the coffee cherry which is the fruit that surrounds the coffee bean. 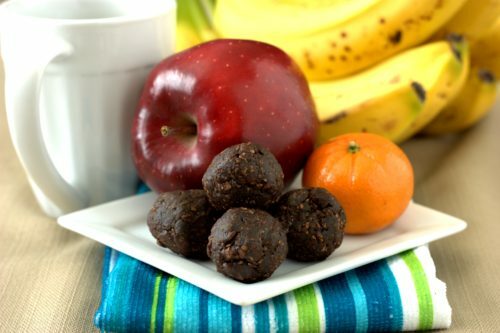 Since I had bulletproof coffee on the mind, I thought it would be fun to make a recipe that played on the bulletproof concept and made Bulletproof Energy Bites. I started with a date base, then added in unsweetened shredded coconut, butter, coconut oil, and a bit of the coffee flour. The result was an energy bite that looked like a chocolate truffle and tasted fantastic. 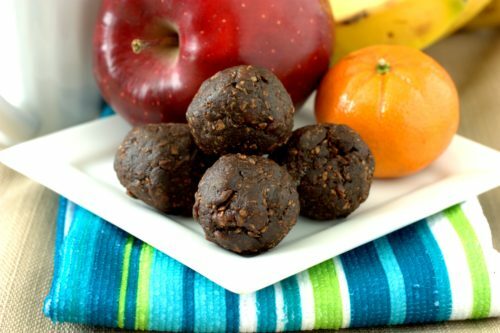 These Bulletproof Energy Bites are a great mini snack for a pick-me-up that will satisfy a sweet craving. Place the dates and coconut in a food processor and mix until chopped fine and begin to stick together. Add in the flour, butter, and coconut oil and process until well mixed and dough sticks together well. Using hands, roll into 1-inch balls and place in a plastic or glass container. Refrigerate until firm; keep refrigerated until ready to eat. This entry was posted in Breakfast and tagged coconut, coffee, dates, gluten-free.